In the 1980s, Romare Bearden and Jean-Michel Basquiat inhabited entirely different worlds. Romare Bearden spent much of his time in his Long Island City studio. Becoming increasingly weak from bone cancer, he was intent upon completing his life’s work. Bearden’s later life was a far remove from the hedonistic downtown NYC scene in which Jean-Michel Basquiat both meteorically rose and plunged. 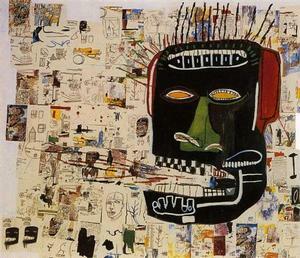 However, because Basquiat had been attracting attention and support from well-known SoHo art figures such as Andy Warhol and gallerists Annina Nosei and Mary Boone for about five years before his national recognition (as the subject of the February 10, 1985 New York Times magazine's cover story), it is quite possible that Bearden had heard about Basquiat. Bearden most certainly was aware of Basquiat between 1985 and 1988, the year that both artists died. Romare Bearden painted Obeah of High Category in 1984, the same year that Basquiat created the work shown on the right. In selecting a Romare Bearden work for his collection, pop-R&B star Usher was particularly drawn to the Obeah of High Category watercolor because of its resemblance to the energy and themes of Basquiat’s work. On Sunday, November 15, 2015, Usher touched-down in Atlanta in his private plane and went directly to the Alan Avery Art Company gallery where Obeah of High Category is on view in an exhibition. 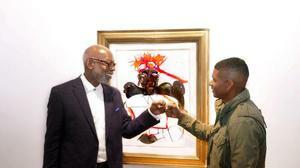 A few weeks earlier, after seeing a photograph of the painting, Usher had arranged to purchase it from Atlanta art broker and advisor Jerry Thomas. Jerry Thomas co-organized with Alan Avery the Romare Bearden: When I Conjure These Memories exhibition which runs through Jan. 16, 2016 at the Alan Avery Art Company. 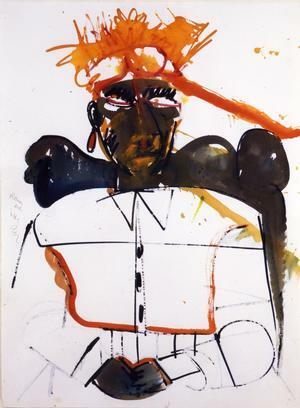 Thomas says that while he feels that Bearden gave “a nod” to Basquiat in Obeah of High Category, he plans to do research in an effort to firmly establish the connection. In this research, Thomas, an attorney, can draw on those investigative skills, as well as the support of knowledgeable associates. 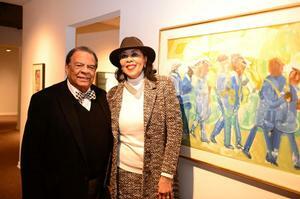 Among those attending the exhibition preview was Spelman University president Mary Schmidt Campbell. Campbell, an art historian, has written the definitive biography on Romare Bearden which will be published by Oxford University Press. Thomas organized When I Conjure These Memories in close association with the heirs of the Romare Bearden Foundation. It is one of the larger and most diverse Bearden exhibitions to ever be held at a private gallery outside of New York City. The possibilities of the Bearden-Basquiat connection are intriguing. Despite the disparity in their ages and lifestyles, there are some strong common denominators in their work. For example, they shared a fascination with conjure and conjuresque figures (such as Basquiat's skull-like heads). Bearden’s interest in the conjure figure stemmed from his rural southern background, Basquiat’s from his Haitian background. They both were influenced by jazz. 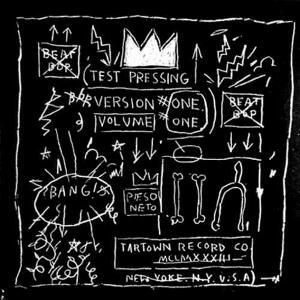 While listening to the music, Basquiat improvised drawings as visual impressions of the rhythms, chord progressions and disjunctures of jazz. And the jazz artists that Basqiat loved were of, or closer to, Bearden’s generation. These Basquiat favorites included Billie Holiday, Dizzy Gillespie, Miles Davis, Max Roach, and most particularly, Charlie Parker. Bearden's expressively-rendered crown on the Obeah of High Category’s head recalls the spiky hair on Basquiat's skull-like heads, the trunks and branches of Basquiat's own hair and his signature symbol: the simple but expressive line drawing of a crown. Jerry Thomas sent images from the Bearden estate inventory to Usher in October 2015. Usher ultimately narrowed his selection down to Obeah of High Category and purchased it from Thomas. 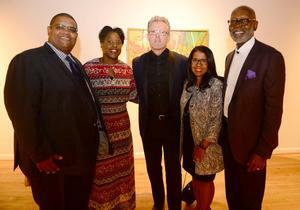 In addition to art advising, Thomas chairs the Fulton County Arts Council and says he is “thrilled to bring the works of one of America's most prolific artists of the 20th century to Atlanta." He predicts that the Romare Bearden exhibit will not only be successful and highly acclaimed, but will demonstrate that Atlanta is poised to become a national market for major art shows. The exhibition has already shown evidence that Thomas's prediction about Atlanta will be realized: six works were sold shortly after the Bearden show opened, including one for nearly $400,000. 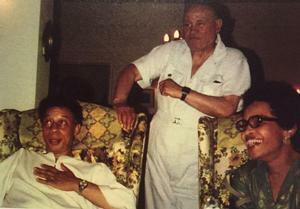 Romare Bearden had extensive ties to Atlanta. Bearden's friendship with artist Hale Woodruff began when Bearden visited Spelman College in 1941 and he made many return visits. Bearden and Atlanta cultural historian Richard A. Long also were close friends. Southern Connections: Bearden in Atlanta was a 2013-2014 exhibition of Romare Bearden materials from Emory University's Manuscript, Archives, and Rare Book Library. 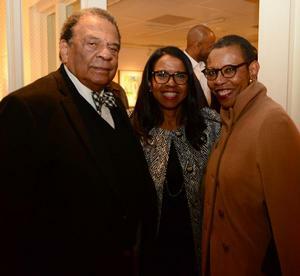 A pillar of Atlanta’s arts and philanthropic communities, Jerry Thomas is married to fellow attorney Andrea Idelle Young-Thomas, daughter of former Atlanta mayor, congressman and United Nations ambassador Andrew Young. Young-Thomas has recently completed the documentary, Andrew Young and the Making of Modern Atlanta, and is writing a book with the same title, which includes a chapter on the role of arts and culture in Atlanta’s growth. Usher served for four years on the board of Atlanta’s Woodruff Arts Center, the parent organization of the High Museum. 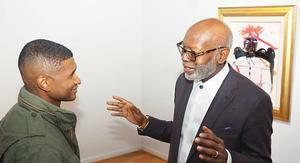 With his growing presence in local and national art communities, Usher is poised to become a leading art patron. When asked whether Obeah of High Category would hang in his suburban Atlanta residence or one of his other homes, Usher simply smiled. It must be sweet to consider all of the possibilities. Maynard Eaton of the Saporta Report contributed reporting to this article. * "10 Essential Cuts from Old School Hip Hop," JamsBio Magazine, January 23, 2009.